• Cortisol concentrations in CSF were measured by radioimmunoassay in healthy controls, depressed patients, patients who had attempted suicide but were not depressed, and obsessivecompulsive patients. The factors that contributed most to the variance in CSF cortisol levels were a diagnosis of depression, height, and important life changes during the six months preceding the investigation. Depression was by far the most important factor. The depressed patients had significantly higher CSF cortisol levels than the controls. 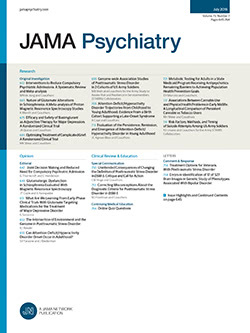 In obsessive-compulsive and depressed patients treated with clomipramine hydrochloride, the levels were significantly reduced. Cortisol levels in CSF were significantly correlated with mean urinary cortisol excretion. Of the three monoamine metabolites measured, only 5-hydroxyindoleacetic acid level was weakly correlated with CSF cortisol level. This correlation was confined to the depressed patients and could be accounted for by the common correlation with height.